The term has finished at the Art Academy and I've been flicking through some of the studies that I have been doing there over the past 10 weeks. The module I have been taking this term has specifically been looking at landscape painting. The greatest experience I have gained has been that of painting plein air, something I hadn't done until now and I've discovered I really enjoy. This is the first painting that I did outside. I think you can tell that I wasn't in my comfort zone at all and consequently the marks aren't what I wanted them to be. It was a great learning curve, having the confidence to just get on with it, chat to passers by and to work quickly in changeable conditions. At the end of the unit, we had the opportunity to rework one of the pieces in the studio. Again not a way of working that I'm at all used to. I usually just shelve something or paint over it if I'm not happy with results. So I took the painting from week 1 and based another painting on it. 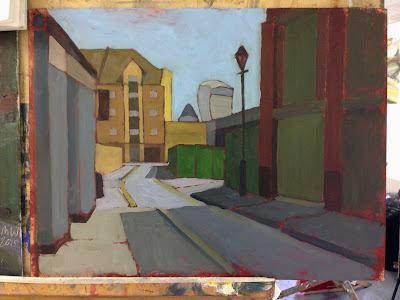 It's the same street, buildings etc I decided to go landscape instead of portrait, had a red primer and tried to get a bit more crispness of line. It still isn't complete, just the main shapes and colours blocked out, but it's a marked improvement! What do you think? 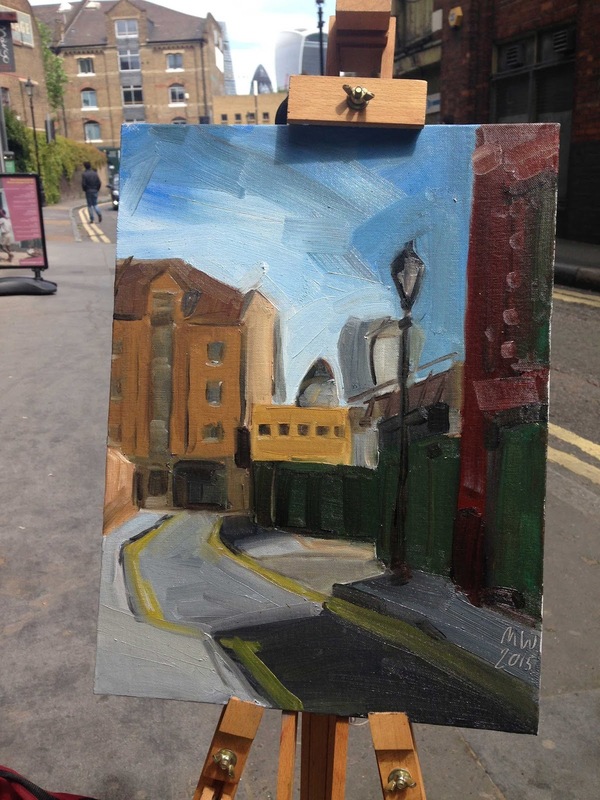 See more of me doing plein air painting.